Improvements in the stock market and sound controls on expenses helped the Archdiocese of Baltimore achieve a positive result on the financial report for the fiscal year that ended June 30, 2017. Other contributing factors were a continued steady growth in offertory donations by parishioners to their local parishes, a portion of which is sent to the archdiocese, and fulfillment of pledges to the Embracing Our Mission capital campaign. “The biggest improvement was in the market,” said John Matera, controller. 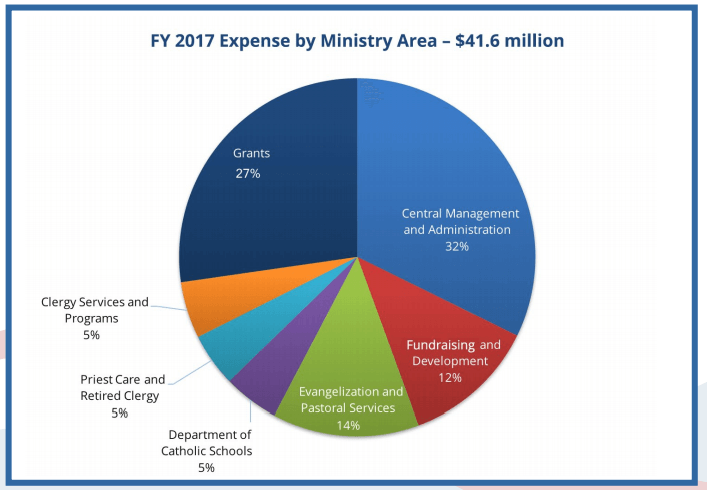 Including investment income and the change in market value of investments, the Catholic Center showed an operating surplus of $2.9 million, on expenses of $41.6 million. That’s an improvement over fiscal 2016, when the operations showed a deficit, including investments, of $6.3 million. Bishop Adam J. Parker, vicar general and moderator of the curia, said, “The primary mission of Central Services is to support the efforts in our parishes and schools to bring the message of the Gospel to all parts of the archdiocese and to implement Archbishop (William E.) Lori’s vision of fostering a sense of missionary discipleship among the faithful. “The various offices within Central Services strive maximize administrative efficiencies in our parishes and schools while also enhancing our ministries of evangelization,” he said. 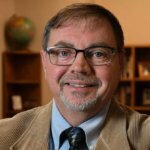 One of the biggest challenges in the year came from four schools that were closed at the end of the 2016-17 school year, according to William J. Baird III, executive director of management services and chief financial officer for the archdiocese. Subsidies to those schools in the years before they closed and costs involved with closing them caused a drain on archdiocesan finances. “Closing those schools will ultimately get us in a better financial position,” he said. 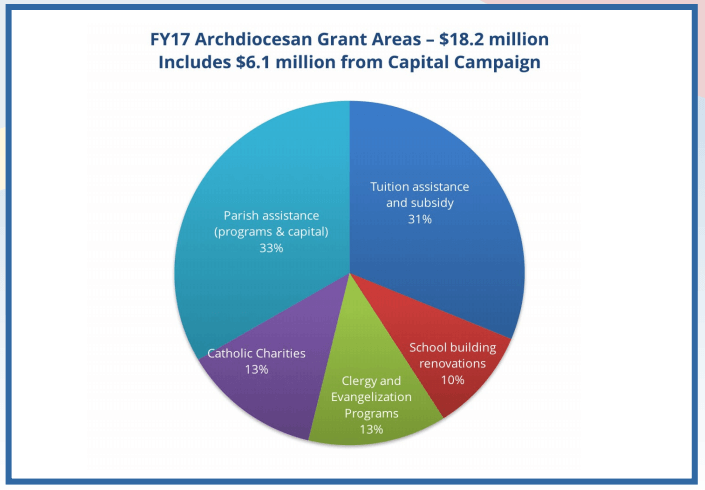 The archdiocese provided $10.6 million in support for parish and school operations from combined sources, including the Archbishop’s Annual Appeal, the archdiocesan Central Services budget and the EOM campaign. 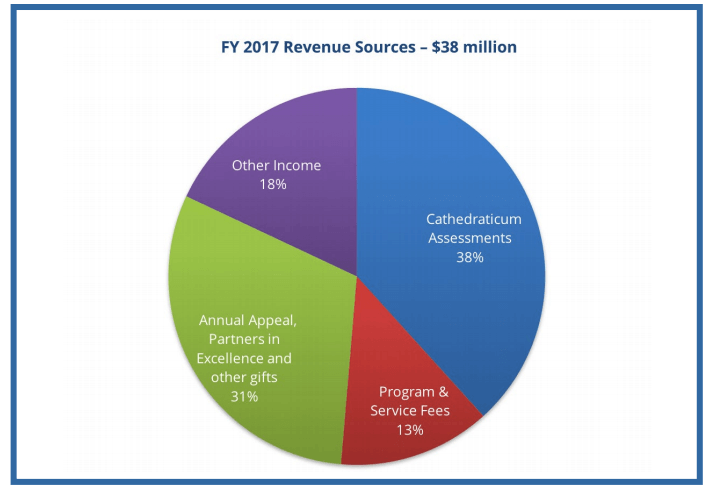 Major sources of revenues for Central Services are the cathedraticum assessment of the parishes, the annual appeal, program and service fees related to religious and education programs, and premiums charged to offset costs of centralized benefits and insurance. The cathedraticum, which assesses parishes based on their ordinary income, totaled $14.4 million in fiscal 2017. The top 10 parishes generated 25 percent of the total cathedraticum revenue. The next 50 parishes generated half the revenue, and the other 88 parishes contributed the final 25 percent. “Proper stewardship of finances is a high priority,” said Baird. “It respects the donor intent and living up to the obligation to do what we say we would do. “The more financially responsible we can be, the further we can stretch a dollar. When we invest in parishes, schools and charities, we do it with that intent,” he said. Bishop Parker noted that the report reflects very favorable market conditions, which are outside the archdiocese’s control. “What we aim to do is maintain a high level of discipline in spending to ensure that the resources with which we have been entrusted are being used to support the mission,” he said. “We regularly examine our staffing and our projects to ensure we are being faithful stewards of our financial resources. In November, Voice of the Faithful, a movement of Catholics concerned with church accountability and transparency, reviewed the websites of all 177 dioceses and archdioceses in the country to gauge fiscal accountability practices. Using a 10-question scale, the group looked at whether diocesan financial information could be easily found and reviewed. The Archdiocese of Baltimore was one of the top six dioceses in the study, earning 55 out of 60 possible points. Baird noted that the only deduction the archdiocese received was for not having a list of the members of its finance council on the web. That has been rectified, with the addition of the roster of the Board of Financial Administration to the site. Even so, the finance office is not coasting. “We’ve done some good things. What more should we be doing?” Baird asked. Matera said his team puts together regular financial reports so that Archbishop William E. Lori’s primary consultative bodies – the Board of Consultors, made up of priests, and BOFA – can see them in a consistent way. If the reports are easy to read, “They can ask questions about the anomalies,” he said. Baird said that a high level of discipline in expense management and a high level of donor support for the archbishop’s goals and priorities are keys to the archdiocese’s financial success. As the archdiocese comes to the end of the Embracing Our Mission campaign, the annual reports outline the amount of resources that have been contributed to support the case elements. Parish needs were a significant part of the capital campaign, and Baird noted that by the time the campaign is finished with an expected total around $150 million, parishes stand to receive 40 percent to 50 percent of all the dollars raised. To further accountability, the archdiocese maintains an ethics hotline, where parishioners or staff members can report complaints relating to financial misconduct or human resources issues. Reports can be made by phone or online and can be done anonymously. The archdiocese receives about one report a month of some kind. “We put our best efforts into addressing those issues,” Baird said. Matera noted that when the archdiocesan audit team goes out to parishes and schools, they look to see whether the posters about the ethics hotline are visible around the facility. Read the full archdiocesan financial report here.